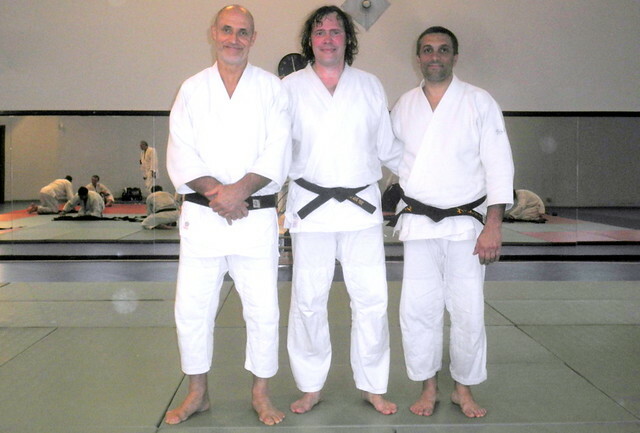 A nice session with Gouttard sensei.. and with old friends in Turin! I spent last weekend in Turin: I had planned to visit my best friend Silvio and by chance I could also attend a session at Yoake dojo with Philippe Gouttard sensei. First time I practice under his teaching and it has been a very nice experience: he worked a lot on the way uke should deliver the best kind of attack, a sincere attack that tori can use in order to perform the technique and learn also what is good or bad in the execution. As sensei said, when uke falls he/she must enjoy it as natural outcome of the movement, not like something that has been forced upon him/her. Sensei pointed out as well a few errors in my movements that will certainly help me to be a better uke, and especially things that could be dangerous when practicing at higher speed with more advanced people (like harmonizing arm and body movements when receiving techniques like shihonage and nikyo ura). I found a very nice interview with Philippe (wit a few videos) that tells more about his Aikido life and his personality. Furthermore, it made me think how it is important always to remember we are Western people doing an Asian martial art, therefore we have a good set of differences. As Philippe sensei says, he realized our Asian teachers are just normal human beings that are good in doing something we want to learn as well, but they are not gods, magicians or heroes! This is something some other sensei forget often, especially some Japanese ones!! The rest of the weekend turned out to be very relaxing and especially I enjoyed discovering some part of Turin that I never knew and a new word as well: the apericena in San Salvario area. 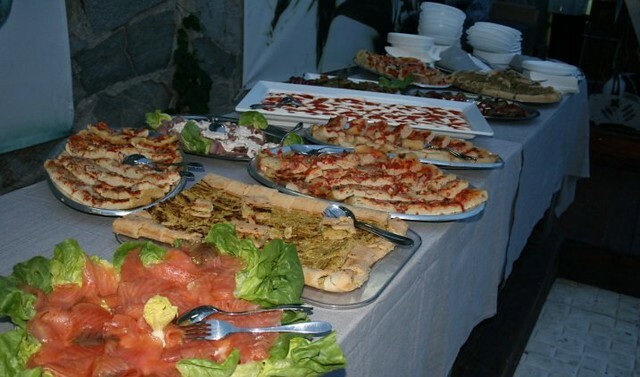 The apericena we had was not too different in the restaurant called Lanificio San Salvatore in San Salvario area in Turin. The area had been for a very long time mostly known for the quite high criminality, being a multicultural aggregation of people, mainly industry workers or poorer. What I have seen in the streets around the area of Lanificio in the evening is an extremely nice meeting area, with several small restaurants and bars and a small square full of young people enjoying the still not too cold evening. A very nice weekend all together, Aikido, friends and good spirit! 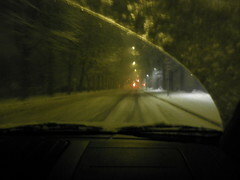 And tomorrow I’m going back to Torino, even if no Aikido this time! “Just” friends!! 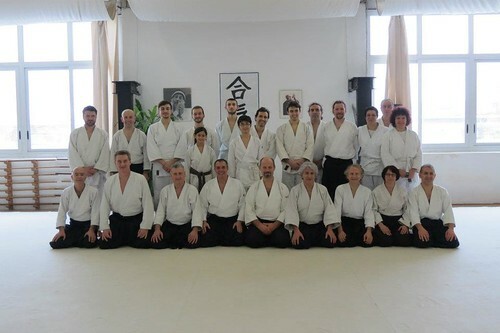 I finally posted about the seminar in Italy with Martufi sensei. It completed a very nice Aikido week in my hometown Biella, where I managed to practice in other 2 dojos, Aikikai Biella dojo and Ken Kyu Sei dojo, and meet lots of very nice people. First Aikido seminar in Italy for me, with Franco Martufi sensei, 6.dan Aikikai, in the Aikikai Italy federation (under Tada sensei and Fujimoto sensei guidance). Actually it is the second seminar in Italy, but the first time with an Italian sensei: my very first time was with Tissier sensei, still in Torino, quite a few years ago..
During all these holidays in Italy I practiced with clubs belonging to Aikikai Italy federation. Interesting to experience for the first time this kind of Aikido. Martufi sensei has a very solid defined position. With a strong kamae, very well centered, sensei showed a good combination of techniques during the weekend. The session opened with techniques from katatedori ai hanmi attack performed striking uke with an atemi (stepping in with irimi) that was met by the partner free arm. Then the techniques were performed pivoting (tenkan) around this new contact point. First from a static step by step form, then in more dynamic way, nice and interesting application. During the weekend we worked also on more traditional techniques from and morotedori attacks. Lots of variations and combinations. A good balance between basics and more advanced forms. From shomenuchi attack, sensei showed different situations for ikkyo: anticipating the entrance or delaying, both that could be caused by a “mistake” by tori. In truth, there is no mistake unless tori starts “fighting” or using force in the technique. Early or late entrance can lead as well to nice forms of ikkyo, as we practiced. As long as the “wrong” timing does not make tori taking “wrong” decisions: with an early entrance, tori can effectively stretch uke upper body and control the technique. With a late entrance, uke‘s arm would be almost completely stretched, therefore just a step backward of tori and using tenkan or sokumen movements would allow again to completely control uke. All in all, ikkyo is always the perfect technique for working on Aikido concepts!!! It is said that o’sensei used to make his sutdents work for years on ikkyo before passing to other techniques. Most of the techniques were very direct. Effective at the first contact, or so. Sensei positions were generally higher than the Aikido I practice more often, but the timing was impeccable. Quite fun indeed the throws! An interesting weekend where I managed to meet a nice bunch of new people, very nice practicing with them. Sensei has an elegant Aikido: his solid kamae and very straight position contribute in the cleanliness of the techniques. Seeing him throwing effortless around his uke during the seminar was quite nice. I am sad I did not manage to receive any technique from him, but it did not surprised me, being the first time visiting that federation. I certainly hope to practice again with him! FUNNY THING OF THE DAY – In Biella railway station there is a funny little self-service ticket box: in order to skip the normal queue for the ticket office, I went for it. Set the ticket route, paid, got the tickets (return).. but no change. Then I looked better at the 2 papers I got: one was actually the return ticket, the other was a credit note to use in the ticket office in order to get the money! So I went back to the queue.. got to the counter, and the guy there, according to “regulations”, he said, asked me for my personal document, wrote the number and made me sign before giving me 8 euro!! Not such a good system in order to cut.. queuing times!! 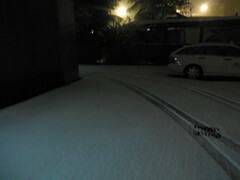 I left Hefei in China for this trip to Italy and it had just started snowing!! I feared not being able to get a taxi to the airport first, and then get some delays or cancellation that would have ruined the trip to Italy.. but all went ok! This weekend I was in Torino, for my first full Italian Aikido seminar (more to write about it, but it was a quite good experience! Fun, yeah!).. 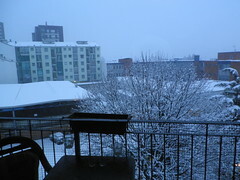 and apparently the snow followed me there as well!! Talking about the bad timing!! 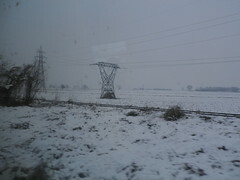 I love snow, but not when later today I will have to go to Malpensa for continuing this trip to France, for work, before starting back to China..
On the way to Torino..
..on the way to my first completely Italian Aikido seminar: I already participated to an Aikido seminar in Torino, but it was with Tissier sensei. This weekend, for the first time, I’ll take part to an Italian Aikikai Aikido stage with Martufi sensei, 6.dan Aikikai, at Piero Villaverde sensei (also 6.dan) dojo. Quite curious after the experience of this week practicing in Biella, to meet also more people from the same group, under Tada shihan and Aikikai Italy. Even more special, during the off-Aikido-time I’ll have the chance to meet my best friend Silvio and another good friend from Trondheim time, Marco, both long time resident in Torino! Many times the past weekend in Shanghai the Aikido friends told me this.. Sorry guys, I do not look fatter, I am fatter! 2 – I fear the great Aikido practice I have planned, both in my home town, where I will visit 2 clubs (Valdengo and Biella, both mainly from Tada sensei – Fujimoto sensei line, therefore quite new to me) and one weekend seminar in Turin (first time practicing under an Italian 6.dan!!). But, even if I have become a fat f@k I am still not rolling like a ball as some of you can wonder: my ukemi is still ok-ish, and I had some tests/proofs at Sunday practice! Oh I loved it! So much.. my body and my mind needs more Aikido, and I look toward these days in Italy with trepidation! Christmas/New Year holidays, since there he could only “abuse” of his poor brothers as training partners.. and this time I look toward Italy as the place where I will practice the most since I left Norway! I will practice more than during my last trip to Norway actually!! Back in Hefei, my plans to start something in the university failed against the.. yoga classes! They got the only room with mats reserved every night until 20:30, and after that the guard wants to close it and go. Also, I hoped I could have a room not used for classes where to bring my home mats, leave there and use them for practice, but it seems difficult.. I got one other plan, but I cannot say anything before trying.. to not raise my hopes too high (and then again get crushed). Anyway, apart from the huge belly, the body is ok: knees and feet are working properly. I can even sit in seiza without big troubles. Still a part of my left foot is a little numb (TCM did not help) but no pain there.. just weird feeling.. So many reasons to be happy and fight my belly!